(Honolulu) – When Silene perlmanii, an extremely rare small shrub with delicate white flowers, was discovered on O‘ahu by botanist Steve Perlman in 1987, just 20 individuals remained in the wild. Within three years, only 6 plants remained, dwindling to a single individual by 1994. The decline of this species at the last known wild site has been attributed to aggressive weeds and introduced ungulates damaging the habitat. According to Hawai‘i state botanist Maggie Sporck-Koehler, “This situation is not uncommon in Hawai‘i, which has the unfortunate distinction of having an extremely rare flora, and is often referred to as the ‘endangered species capital of the world.’” Hawai‘i’s flora is exceptionally unique with approximately 90% of flowering plants and 70% ferns found nowhere else on earth. All that is preventing the loss of these unique species forever is a small group of dedicated conservationists, including the Department of Land and Natural Resources (DLNR), Division of Forestry and Wildlife (DOFAW), which conducts several types of plant conservation activities with the help of partners statewide, including the U.S. 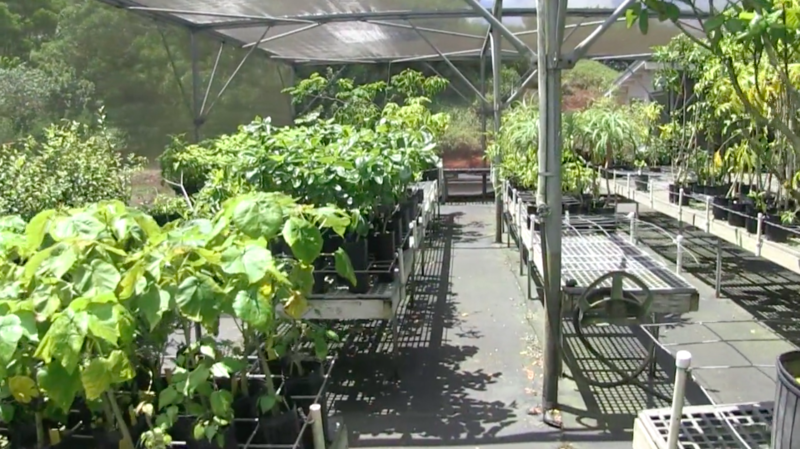 Fish and Wildlife Service, Hawai‘i Rare Plant Restoration Group, and Research Corporation of the University of Hawai‘i. One significant component to DOFAW’s ongoing plant conservation and habitat protection projects are the state-run plant nurseries. The rarest plant species are grown in the state’s mid-elevation rare plant facilities located on Hawai‘i island, Maui, O‘ahu, and Kaua‘i. DOFAW district botanists and experts from one of DOFAW’s most highly specialized conservation partners, the Plant Extinction Prevention Program (PEPP), carefully and strategically collect from rare plants in the wild, in places where natural plant regeneration is not occurring due to a variety of threats. Some of the seeds and other propagules collected by these expert botanists are taken to those nursery facilities to be grown and eventually outplanted back into protected areas in the wild. The ultimate goal of DOFAW’s district botanists and the PEPP coordinators is to keep rare and imperiled species from declining further and to help restore these species and ensure their survival long into the future. In the case of PEPP, preventing extinctions is their highest priority, with a focus on species with fewer than 50 individuals remaining in the wild. The mid-elevation rare plant facilities propagate primarily state and federally listed threatened and endangered (T&E) species. While preventing extinctions is one of the important jobs performed by DOFAW and its partners, supporting restoration of ecosystem structure and function is another task of state nurseries. They also propagate many different species of native plants, some T&E, some common species, and numerous trees for windbreak purposes. The State Tree Nursery provides high quality native tree species and windbreak trees and plants for both the public and DLNR-state sponsored out-plantings and reforestation projects. DOFAW and partners use state-propagated native plants to help restore natural areas on a large scale in the Nakula Natural Area Reserve and Kahikinui Forest Reserve on Maui. The leeward south slopes of Haleakala were once covered in koa-‘ohi‘a montane forests and alpine shrublands but many years of impacts from feral ungulates and invasive plant species had resulted in the ecosystem being reduced to eroded grasslands with scattered trees. Without trees to capture the moisture, streams which used to flow have dried up. Within Nakula, DOFAW staff and partners have restored over 97 acres of the degraded land with over 64,000 Hawaiian native plants, subsequent to fencing and removal of feral cattle, goats, deer, and pigs. In neighboring Kahikinui, another 50,000 native plants have been planted, with high levels of survivorship. Several important native Hawaiian tree species (some examples of these are koa, mamane, wiliwili, ‘iliahi, naio, and kolea lau nui) as well as several native species of shrubs, vines, and herbaceous understory plants (e.g. ‘ilima, maiapilo, ‘u‘ulei, pilo, ‘a‘ali‘i) have been successfully propagated and outplanted into highest priority restoration sites. By reforesting degraded areas which have lost their native Hawaiian biodiversity of plants, this work will allow for their recovery, and also the recovery of the birds, snails, and other invertebrates that are native residents of these areas. As a member agency, DOFAW supports the Hawai’i Rare Plant Restoration Group’s recently released Hawai‘i Rare Plant Code of Conduct to help guide forest visitors. A link to it is listed below under resources.